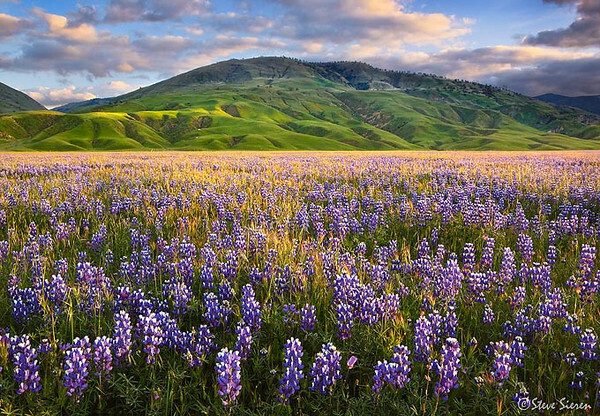 This has been the hightest concentration of lupine I’ve ever seen. Thank god the sun broke through for a minute here, I was waiting for it! It was such a beautiful sight to see and I’m glad I can share it with you! This entry was posted on April 5, 2010 at 9:12 am and is filed under Uncategorized. You can follow any responses to this entry through the RSS 2.0 feed. You can leave a response, or trackback from your own site. Steve… this is a spectacular photograph! Such amazing depth and the colors/light are exceptional. Can only imagine how it felt to actually be there. Hi Steve. Stunning photograph. Just a reminder that these fields are on private land so hopefully, people won’t rush out there to try and duplicate your beautiful work (not that anyone could regardless!) Property owners are getting very upset with the amount of trespassing, leaving trash, trampling the flowers, etc. I’m not the wildflower police by any means, but I am concerned about the situation, and have just started The Wildflower Conservancy to help educate people about responsible wildflower enjoyment. wow! Man… this absolutely gorgeous. Perfect composition, great light, awesome scene. I´m really drawn to the clouds and that green mountain! Kahlee, I’m with you on the concerns of littering, trespassing, and trampling of any or all wildflowers. I have even been known to pick up other peoples trash and even whine about things that other people have thought to have been petty. Each and every footprint compacts the soil so even if you are not stepping on the ground where a flower is growing it might effect next years crop. When ever I come across something fragile even beyond wildflowers I never broadcast its where abouts maybe even tick other photographers with a vague description that doesn’t help out much in finding things. I do not condone any kind of copycat work, mine or others and try to create a following. I pulled off the freeway and leaned a little far over the game fence near a truck that was pulled over by a CHP who decided not to give me a talk about why I should not do that as he drove off. I do not know why he did not exange words with me but thanks for the friendly reminder or easy going slap on the hand Kahlee. If there is anyone out there that can tame the wild energetic types like me from doing the wrong thing it is going to be you. I highly support your new organization. Green foothills abound in the valley. Awesome! Beautiful! Worthy! I love it. Thanks so much, Steve. Your ethics are as outstanding as your work, and I really appreciate your support. I have so much to do to get my little fledging organization off the ground. My comment earlier was not meant as a “slap on the hand” at all, as I figured you would be on the right side of the fence. LOL! But sometimes people who see vistas like this don’t know the care that was taken to get the shot without trespassing or damaging the flowers. Glad anyone who sees this gorgeous image will also know how careful you were to respect the flowers and the private property in getting it. This is amazing Steve. The lupine looks more robust in this photo than they were a few weeks ago when I was out there. The light is amazing too. Outstanding image, Steve. All around, really. Great work.